Rating: 4/5- Is it the Swamp Thing or the Man-Thing…or Both? I was in the process of organizing some comics and the fourteenth issue of Phantom Stranger caught my eye! 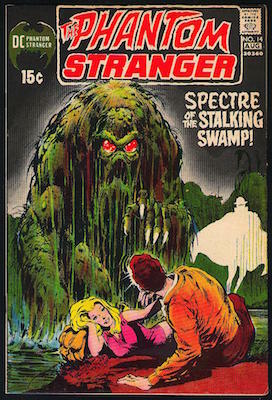 First of all, this was one of the last issues of the Phantom Stranger series that I was missing as this was the toughest of the issues to find in decent grade and second, the cover had an image that showed a character whose image is really similar to that of the Man-Thing, with a tagline that read “Spectre of the Stalking Swamp!”, hinting at both “swamp-like” characters at Marvel and DC. Not only that, but after I checked the date on this issue, it came out the same year as both first appearances of Swamp and Man-Thing…1971! The first story is called “The Man with No Heart” and was written by Len Wein with some fantastic art by Jim Aparo. In this issue a cultist is dying and in order to further his own life, traps the Phantom Stranger in a pentagram and orders him to give him his heart. After a rushed surgery and heart transplant, the cultist is haunted by the Phantom Stranger, eventually fleeing to an old castle where there is a twist ending that pays off. It’s a fun short story that was more enjoyable because of Aparo’s moody art, but definitley holds up on the writing. The second story stars Dr. Thirteen and is titled, “The Spectre of the Stalking Swamp!” It’s here where we first meet the Swamp Creature in a story that was written by Swamp Thing creator, Len Wein! Unfortunately the story was a let down, but it had some hints of what we’d see with Swamp Thing. For example, in a panel on the second page it explains that an individual from a family of settlers in the bayou got lost in the swamp and was never seen again. Further, Wein writes, “some say that the fella never died, that he mingled with the swamp, became part of it”. It was cool to read and gives you the idea that this was probably written prior to both character’s introductions, although it was published after. I don’t want to spoil the ending in this review, but I will say that there’s a reason why THIS Swamp Monster didn’t pan out and the other two did. That being said, this was a pretty fun read to see just how similar he is to the Man-Thing artistically, and to read about some of the ideas that would later be introduced with Wein’s writing of the Swamp Thing. As I mentioned earlier, this is one of the tougher Phantom Stranger issues to be found in decent grade so expect to pay a little more than the other issues, but if you can find one I’d consider it a deal considering the history and coincidences! This entry was posted in DC Comics and tagged comic books, Len Wein, Man-Thing, Phantom Stanger, Swamp-Thing, vintage comics. Bookmark the permalink.